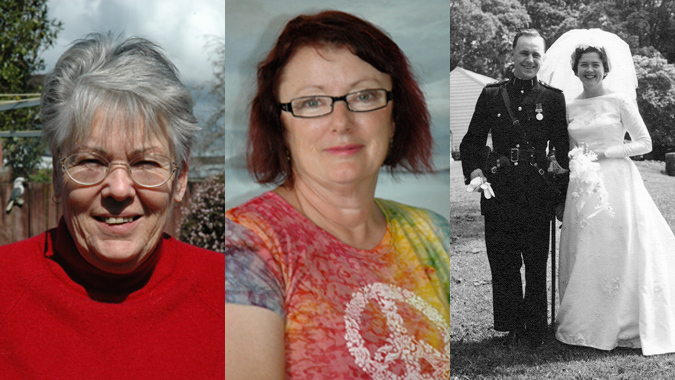 New Zealand Vietnam veterans' wives and children share their perspective of the Vietnam War. Before he went, I would get my warrant each fortnight, you know, for the groceries and that sort of thing. And he would pay all the bills. But when he came back – while he was away actually, I got my driver’s licence. So when he came back, the first thing I said to him was we were going to buy a car. And he said, ‘but I can’t drive’. And I said, ‘no, but I can’. So we went out and bought a car. And then the second thing was I said to him, ‘we need a cheque book’. Open a bank account and have a cheque book, because I said ‘I’ve been paying the bills all this time, while you’ve been away’. Whereas before, he’d been paying the bills. And I said, ‘I’m used to doing it, so I’m going to keep doing it’. And he said, ‘fine’, because he felt that I was better with the money than what he was. So I took over all of that, and I’ve been doing the bills, the accounts, the money, and that sort of thing, ever since. So a lot of that changed. Whereas before, he’d been doing all that – all I got was the warrant, I did the groceries and that was basically it. And he did all the rest. But once he came back, no, everything changed. I remember writing letters to him because I wanted a Vietnamese doll. They used to stand on a little wooden plaque – I suppose about four inches by three inches. They had ridiculously long legs. And they had the wee coolie hat, and they had – I don’t know what you call those dresses that go over the long white pants, but they had those. And I desperately wanted one because everyone else had one. So I wrote and asked him for one and he sent it back, and he was writing letters to me. So they just started emerging in the playground did they? I suppose in people’s houses. But that was what I definitely wanted. All the girls had them. It was a hugely prized possession. If your Dad was in Vietnam, you needed to get one of these Vietnamese dolls. And then I must have sent something to Mum about, ‘Oh, it’s a drag writing letters to Dad’. And she must have told him that, and he never wrote to me again. And I feel really sad about that, because she should have made me do it anyway. He left to go to Vietnam when Anne Marie was about 9-10 months old. And I had just started my pregnancy with my fourth child. So I had that early part of my pregnancy to get through when he had to go away. And I had a bit of a rough time but, fortunately, I had good friends around me in the camp to back me up because I was well away from family – they were in Auckland, I was in Linton camp. Peter came back again, fortunately for us his service over there was curtailed. And he came back when, I think Anne-Marie would have only been about 10 or 11 months old. And I think it took her, as a little child at that age, quite awhile – although whether Peter noticed it I don’t know – but she would not go to her father for anything, and she really clung to Mum if things were needed to be done for her. And I think that aspect of army life, for a lot of women, was quite hard. With the young children. I guess the big separation was Vietnam. That year away. I found it a really hard year. We had Don’s youngest brother was in Wellington at a hostel in Wellington – he was just a young fellow working at the Post Office. And so he was down here but he was very young – we didn’t really see much of him. He’d sometimes ring up and, say, come out and mow the lawns, and he’d come and spend an afternoon tinkering with his motor and his car [laughs]. Then I’d give him lunch and he’d go home [laughs]. But of course we had five children by that time, and Lisa was only six months, or just about six months when Don left. So Francis had not long started school – well she’d been a school five months I suppose, six months. So there were three at school. Paul at kindy, and Lisa. And Lisa was a really good little baby so I was very lucky.